Founded in September 2009 by Franny Armstrong, Director of ‘The Age of Stupid’, 10:10 is a popular Global Warming Mitigation Campaign based in U.K. Aiming at inspiring actions that can reduce carbon emissions by 10% in the current year 2010, the campaign stands as a preparation for the UN Climate Change Conference in Mexico in December this year. The organisation has gained support from major and diverse public figures including politicians, celebrities, educational bodies, companies and other organisations and has also produced different checklists on how different sectors can cut their carbon emissions. One of the first programmes under the 10:10 campaign, called “Lighter Light”, took place on March 28, 2010 and was a reported success. On this day, clocks in Britain were moved by another hour so as to give Britain an extra hour of sunlight in the evening rather than in the morning when most people are asleep. The second action for the campaign however was a public disaster and made news this past week for all the wrong reasons. To raise awareness on taking green action on 10th of October, 2010 (10/10/10) 10:10 released a promotional video called “No Pressure”. Written by Britain’s leading comedy writer Richard Curtis, the film is public on Youtube and shows school children, actress Gillian Anderson and ex-footballer David Ginola being blown up into pieces for not caring enough about climate change. 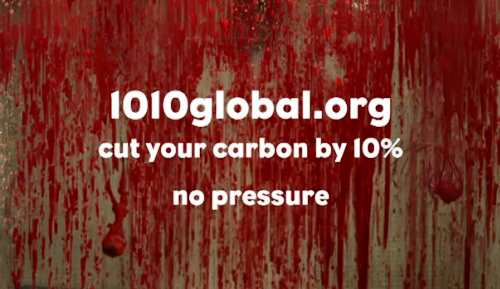 The video ends with a caption “Cut your carbon by 10%; No Pressure”. 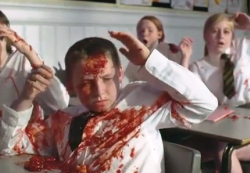 While some took the video in the humour that it was intended, several others took it as gory and distasteful. Sony, one of the sponsors of the campaign quickly dissociated itself from 10:10 after reportedly declaring the video to be ‘ill-conceived and tasteless’ and that it was released without the company’s knowledge or involvement. As of today, Sony’s logo has been deleted from the 10:10 website. This video has itself been withdrawn from the campaign after widespread complaints. Other corporate partners such as Kyoora Mita have also come out to condemned the short film. What the video also did was to give another shot in the arm to the climate skeptics, many of whom have been more vocal in the present year than ever before. “So according to them, climate change will kill us in the near future, but not believing in it (read them) will kill us right away”, noted a geology backed climate skeptic from North India. The video, which was first removed from Youtube (after some 2 lakh views) has now been put back up again under the heading “EPIC GREEN FAIL” along with the apology issued by 10:10. In a world threatened with terrorism, in all its forms, blowing up people like this was sure to receive such a reaction. Next in line for 10:10:10 is the joint effort of 10:10 with 350.org for marking today as “A day of positive action on Climate Change”. (Editor’s Note: 350.org writes to inform that it also dissociated itself with the 10:10 Global campaign, though went ahead with the 10.10.10 Global Day of Action. 350.org Co-founder and eminent environmental writer Bill McKibben had this to say on the Climate Proress Blog, “We put out a statement at 350.org saying we had nothing to do with it–we didn’t see it till it had made its way around the web, and as soon as we did we let people know we thought it was disgusting). The day is planned to include a lot many events in reportedly 180 countries, including Sumo Wrestlers in Japan, over 10,000 schoolchildren planting trees in Croatia and Russia, a telethon on National TV in the Netherlands and the President of the Maldives installing Solar Panels on his roof. What has to be seen today is that will the mixed reactions of the recent past cause any disturbance in the events or will people give it their full support. But as the Team 10:10 says, “Onwards and Upwards”, hoping for some green innovative initiatives. All the very best 10:10 ! forgetting about the controversies, 350.org’s global day of action on 10/10/10 got a tremendous response, with over 7000 people from all over the world participating in whatever way they could. A few friends and I cleaned up the playground outside my place in Pune, India.